Meet our most recent Featured Library Employee for the Missouri Library Association, Debbie Luchenbill! I had a work-study job in circulation at a public library in the Boston area one summer when I was in graduate school and really, really enjoyed it. A few years later, when I was figuring out where to go from my job in admissions there, I realized that working in libraries met all of what I was looking for: someplace where I could help people and connect them with information or other things they needed, where I could continue learning, and where it was a good thing to be a generalist. While my initial focus in libraries was on public libraries and especially youth/teen services and readers’ advisory (still interests of mine! ), my interest in leadership and administration led me on a more non-traditional library path, to working with the National History Day program at the State Historical Society of Missouri and now at MOBIUS. The people! I have fantastic coworkers at MOBIUS and my favorite part of what I do involves my interactions with the staff at the Missouri Evergreen libraries – especially when I get to visit them in-person for training. Different from a traditional library setting, my “patrons” are the staff members of all the libraries with which we work. It is a joy to be a part of helping the libraries be able to better serve their communities! MOBIUS also recently launched its new MOSS service (MOBIUS Open Source Solutions) where we are expanding our Evergreen hosting and managing services outside Missouri, and it is very exciting to be a part of a new service from the ground-up! I love that every day is different, though that also brings its own challenges–my plans for the days are often derailed! That’s certainly not unique to my particular work, but is always a challenge. It’s also just an exciting time right now, as Missouri Evergreen continues to grow and as we launch MOSS, because there are so many details to keep track of and nurture, and because we work with people with all different skill levels and different levels of comfort/familiarity with technology. It’s a challenge, in a good way, to explore and figure out the best ways to communicate and to convey information to people. My work with the Evergreen ILS has made me passionate about library open-source software and the open-source community. It wasn’t something I was familiar with at all before beginning this work. The people involved in the Evergreen project are fantastic – programmers and librarians alike – and are really focused on making a high-quality product that meets the needs of the end users in the libraries (staff and patrons). Because everyone who uses the software is a part of that community, and because there is not a company that owns the software, it’s very dynamic, flexible, and customizable. For instance, changes/enhancements that the Missouri Evergreen libraries request and that my colleague, Blake Graham-Henderson, programs, gets contributed back to the larger community, so that everyone in the world who uses Evergreen benefits from the changes Missouri Evergreen requested. And we benefit in the same way from developments other Evergreen libraries make. It’s wonderful to be a part of that kind of global community. The Evergreen community is also very focused on the things librarians are passionate about, like protecting patron privacy, equitable and easy access, and doing the best to meet the needs of our patrons. I have been lucky to have had many wonderful mentors, both inside and outside of LibraryLand. 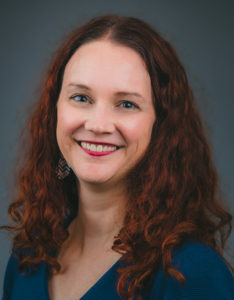 One has been Kaite Mediatore Stover, Director of Readers’ Services at Kansas City Public Library, who encouraged and supported my early interest in readers’ advisory, continues to check in with me at conferences, and has helped me be involved in various capacities in RUSA. I’m in the middle of reading “How to Find Love in a Bookshop” by Veronica Henry. It’s about a bookstore in the Cotswalds and all the interconnected stories of the founder of the store, his daughter who comes to run it when he dies, and various patrons and employees of the shop (and the developer who wants to buy it and tear it down). So far, it’s a lovely, delightful read and I like how the founder’s vision of creating a place for book lovers of all kinds becomes a reality in the little town and how it illustrates the effect that each person can have on those around them. Also, this week is when the movie, Star Wars: The Last Jedi comes out, and I am so excited! I can’t wait to see how the storylines of all the characters progress. It’s great to see old friends from the original movies and I love the newer characters we were introduced to in The Force Awakens! I’ve loved all the connections I’ve made to library workers all over the state and nation both through my work and by being involved in MLA and ALA. It’s so inspiring to learn from and catch up with what people are doing and passionate about. Keep up the great work! Would you like to nominate someone to be our next Featured Library Employee on the MLA website and in a future issue of MO Info? Submit name(s) and contact information (preferably email), along with place of employment, to Shannon Mawhiney at smawhiney@missouristate.edu. Renew Your Membership for 2018 Today!